II Fugue: Liberty and Union Now and Forever. 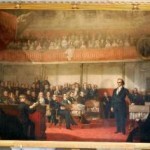 The piece was inspired by the large painting above the stage in the Great Hall, Webster replying to Hayne. “Faneuil Hall pays tribute to the city of Boston through a musical portrait of the landmark that has housed pivotal meetings and events in the history of the United States. Faneuil Hall was built in 1742 as a market house that offered a meeting hall on its upper level. 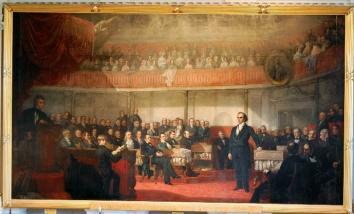 The hall has been referred to as “the Cradle of Liberty,” in connection with its status as the location for citizens’ meetings and government actions that advanced the cause of liberty. The first movement is cast in the form and meter of a lullaby. The overall mood is meditative, lyrical, and post-Romantic in nature. The melodic and harmonic materials are derived from nontonal modes based on intervallic patterns related to flamenco modes. There is a hint of Impressionism, but within a flamenco-inflenced language. Pamela Decker is professor of organ and music theory at the University of Arizona and organist at Grace St. Paul’s Episcopal Church, both in Tucson. She has performed as a featured recitalist at American Guild of Organists national (1992) and regional conventions, the University of Michigan Conference on Organ Music, the Twice Festival, the Redlands Organ Festival, and the Tallinn International Organ Festival, among others. Some of her major works have been recorded by Douglas Cleveland, Janice Beck, and Christa Rakich. Dr. Decker holds a Doctor of Musical Arts from Stanford University and was a Fulbright Scholar in Germany. She has won prizes in national and international competitions as performer and composer. In 2004, she was awarded the Henry and Phyllis Koffler Prize for Research/Creative Activity and, in 2000, she was awarded the College of Fine Arts Award for Teaching Excellence, both from the University of Arizona.